ANNAPOLIS, MD – This week, the Khaled bin Sultan Living Oceans Foundation (KSLOF), in partnership with Friends of the Environment (FRIENDS), is taking students and teachers to restore a local mangrove forest. 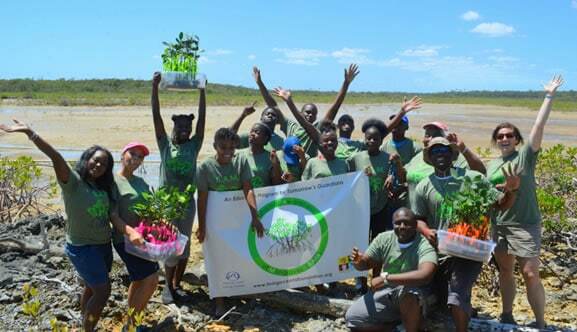 It’s the final phase in a new mangrove education and restoration program called Bahamas Awareness of Mangroves (B.A.M.). 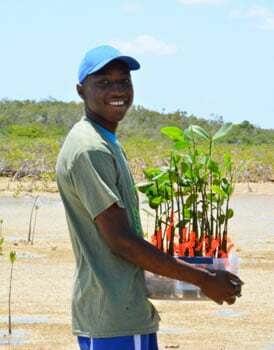 Forty-five students from Abaco Central High School and Forest Heights Academy will visit degraded sections of mangrove forests in Abaco to plant mangrove trees they have been growing all school year. As well as planting 135 mangrove trees, Amy Heemsoth is working with teachers to help them plan for next year’s B.A.M. program, and visiting classrooms to help students analyze the data they have been collecting on the growth of their mangrove propagules. “We are bringing STEM (Science, Technology, Engineering, & Math) education and hands-on learning experiences to students in The Bahamas,” says Kristin Williams, Executive Director of FRIENDS. “The B.A.M. project is a great hands-on experience for students.” It’s another great way FRIENDS is inspiring pride and awareness in students by introducing them to science and exploration in their local environment. The Khaled bin Sultan Living Oceans Foundation is a US-based nonprofit environmental organization that protects and restores the world’s oceans through scientific research, outreach, and education. Friends of the Environment works to preserve and protect Abaco’s terrestrial and marine environments in order to achieve sustainable living for the wildlife and the people of Abaco.